George Wyth achieved his greatest prominence as a founder and first president of Viking Pump Company. Along with P. C. Petersen and Dr. Will Hearst, he formed the company in 1911 to manufacture a rotary pump invented by Jens Nielsen of Cedar Falls. Wyth retired as president in 1944 and was succeeded by his son, Robert. Both men were extremely active in local community affairs. George Wyth was instrumental in establishing the Cedar Falls parks system. He was elected to the first Park Board in 1919, when the city had just two small parks. By 1937 the city had 250 acres of park land, including riverfront areas and a golf course. George Wyth Memorial State Park between Cedar Falls and Waterloo was named in honor of this outstanding supporter of public recreation areas. 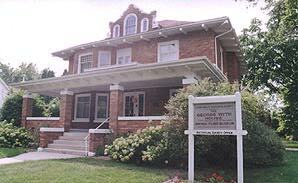 F. W. Paulger built the George Wyth House around 1907. It was originally a white frame structure. The brick veneer was added as insulation in 1925 after Wyth purchased the house. The house was bequesthed to the Cedar Falls Historical Society by George Wyth's daughter, Dorothy. The house was refurbished with the theme, "a family home influenced by the Art Deco period." The third floor houses a gallery featuring Viking Pump and also shares the early history of the pumps. On prominent display are the original wooden prototypes created by Jens Nielsen.